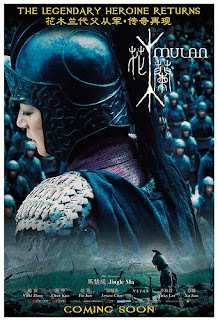 Based on the Chinese folk heroine Hua Mulan. When the country is threatened by invaders, a young girl defends her father by sneaking away from home and dressing up as a man to join an all-male army where she eventually assumes a historically critical role in defending the nation in a time of war. Unlike its Disney animated counterpart, the ending isn't a happy one. The story started off slow, and the ending was not satisfactory. The scenery was nice, and the fighting scenes were realistic enough. The ending although a disappointment, shows the realism of life: not all people get their happy ending, having to put their country above themselves during that choatic period. If you can live with it, then this movie would be worth watching. But it's not a movie I would particularly recommend.